For the ¤ currency symbol, see currency sign (typography). Not to be confused with currency code (the three-letter ISO 4217 abbreviation). This article contains Unicode currency symbols. Without proper rendering support, you may see question marks, boxes, or other symbols instead of currency symbols. A currency symbol is a graphic symbol used as a shorthand for a currency's name, especially in reference to amounts of money. Although several former currency symbols were rendered obsolete by the adoption of the euro, having a new and unique currency symbol – implementation of which requires the adoption of new Unicode and type formats – has now become a status symbol for international currencies. The European Commission considers the global recognition of the euro sign € part of its success. In 2009, India launched a public competition to replace the ₨ ligature it shared with neighbouring countries. It finalised its new currency symbol, ₹ (₹) on 15 July 2010. It is a blend of the Latin letter 'R' with the Devanagari letter 'र' (ra). When writing currency amounts, the location of the symbol varies by language. Many currencies in the English-speaking world and Latin America place it before the amount (e.g., R$50,00). The Cape Verdean escudo places its symbol in the decimal separator position (i.e., 20$00). In many European countries such as France, Germany, Greece, Scandinavian countries, the symbol is usually placed after the amount (e.g., 20,50 €). The decimal separator also follows local countries' standards. For instance, the United Kingdom often uses an interpunct as the decimal point on price stickers (e.g., £5·52), although no longer generally does so in print. Commas (e.g. €5,00) or decimal points (e.g. $50.00) are common separators used in other countries. See decimal separator for information on international standards. Older currency symbols have evolved slowly, often from previous currencies. The dollar and peso symbols originated from the mark employed to denote the Spanish real de a ocho, whereas the pound and lira symbols evolved from an L standing for libra, a Roman pound of silver. Newly invented currencies and currencies adopting new symbols have symbolism closer to their adopter. The added center bar in the real sign is meant to symbolize stability. The new Indian rupee sign, ₹, is a stylized combination of Latin and Devanagari letters. There are also other considerations, such as the perception of the business community and how the symbol is rendered on computers. For a new symbol to be used, software to render it needs to be promulgated and keyboards need to be altered or shortcuts added to type the icon. 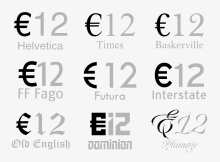 The EU was criticized for not considering how the euro symbol would need to be customized to work in different fonts. The original design was also exceptionally wide. These two factors have led to most typefaces employing customized, font-specific versions, usually with reduced width. Bolivian boliviano Bolívar sometimes Bs.F. Bs.F. Venezuelan bolívar variant Usually Bs. c cent &c. variant Preferred by currencies such as the Australian, New Zealand, South African cents; the West African CFA centime; and the divisions of the euro. Ch. Bhutanese chhertum A centesimal division of the ngultrum. ₡ Costa Rican colón, symbol was also used for the Salvadoran colón. The Salvadoran colón was discontinued in 2001 and it was replaced by the US dollar. د.ك Kuwaiti dinar Latin form: K.D. дин Serbian dinar Latin form: din. ), which share the same Unicode space. Kiribati and Tuvalu's dollars are pegged 1:1 with the Australian dollar. Brunei's dollar is pegged 1:1 with the Singaporean dollar. Unicode: See $ for variants. € Euro In addition to the members of the eurozone, the Vatican, San Marino, Monaco and Andorra have been granted issuing rights for coinage but not banknotes. ₣ Comorian (CF), Congolese (CF, FC), Djiboutian (Fdj/DF), Guinean (FG/GFr), CFP Franc (₣) and Swiss (SFr) francs Also F. The character ₣, representing an F with a double bar, was the symbol of the French franc, Sometimes it is represented by a ligature Fr in some fonts. Faroese króna Faroese króna pegged 1:1 with Danish krone, which is in turn pegged to the Euro through the ERMII. E Swazi lilangeni Symbol based on the plural form "emalangeni". lp Croatian lipa A centesimal division of the kuna. M Lesotho loti Symbol based on plural form "maloti". p Alderney, British, Falkland Islands, Gibraltar, Guernsey, Jersey, Manx (M£) and St. Helena pennies The penny is now a centesimal division of the pound. pt Egyptian piastre A centesimal division of the Egyptian pound. There's also a symbol used locally in hand writing in sometimes in print represented by a stylised Arabic letter dotless qaf ق placed above the digits. It is not present in computer systems, and due to that its use is dwindling. Also ₤ and L. All, except EGP, are pegged 1:1 to GBP. EGP also abbreviated L.E. (short for French livre égyptienne), and, in Arabic, ج.م. There's also a symbol used locally in hand writing in sometimes in print represented by a stylised Arabic letter dotless geem ج placed above the digits, (visually similar to ـحـ ). It is not present in computer systems, and due to that its use is dwindling. q Albanian qindarkë A centesimal division of the lek. : Early 2017 the National Bank of the Kyrgyz Republic approved an underlined C as new currency symbol. WS$ Samoan tālā Symbol based on previous name "West Samoan tala". Chinese Renminbi yuan (元/圆) Used with one and two crossbars. 円 (en, lit. "circle") is frequently used in Japan colloquially. 元 is also used in reference to the Macanese pataca and Hong Kong and Taiwanese dollars. ^ (in Portuguese) Banco de Cabo Verde. "Moedas Archived January 22, 2011, at the Wayback Machine." Accessed 25 Feb 2011. ^ "The real. rs money" (PDF). ECB. p. 3. Retrieved 2011-05-21. ^ Banky Foiben'i Madagasikara. Accessed 24 Feb 2011. ^ Bank of Guyana. Accessed 25 Feb 2011. ^ Centrale Bank van Aruba. About Us – A Brief History of the Bank." Accessed 23 Feb 2011. ^ National Bank of Rwanda. "Legal tender." Accessed 25 Feb 2011. ^ University of British Columbia: Saunders School of Business. "Currencies of the World." Accessed 25 Feb 2011. ^ Lonely Planet. "Rwanda." Accessed 25 Feb 2011. ^ Banco de Moçambique. Accessed 25 Feb 2011. ^ Forexforums.com. "Currency symbol finder Archived 2011-02-21 at the Wayback Machine." Accessed 24 Feb 2011. ^ Banque Centrale de Mauritanie Archived 2010-12-19 at the Wayback Machine. Accessed 25 Feb 2011. ^ Bank of Mauritius Archived 2006-12-28 at the Wayback Machine. Accessed 25 Feb 2011. ^ Nepal Rastra Bank. Accessed 24 Feb 2011. ^ Central Bank of Seychelles. Accessed 25 Feb 2011. ^ Central Bank of Somalia. Accessed 24 Feb 2011. ^ The Reserve Bank of Vanuatu. "Current Banknotes and Coins in Circulation." Accessed 25 Feb 2011. ^ Everson, Michael (2017-10-22). "N4787R2: Proposal to encode the Wancho script" (PDF). ^ Evensen, Nina Marie; Anderson, Deborah (2012-07-24). "L2/12-242: Proposal for one historic currency character, MARK SIGN" (PDF). ^ "Bengali Code Chart, Range: 0980–09FF" (PDF). The Unicode Standard. Retrieved 2017-07-15. ^ a b c Pandey, Anshuman (2007-05-21). "L2/07-192: Proposal to Encode the Ganda Currency Mark for Bengali in the BMP of the UCS" (PDF). ^ a b Everson, Michael (2015-12-19). "L2/15-338: Proposal to encode four N'Ko characters in the BMP of the UCS" (PDF). ^ Pandey, Anshuman (2015-11-05). "L2/15-121R2: Proposal to Encode Indic Siyaq Numbers" (PDF).